Digitally remastered edition of the British Pomp Rock band's 1975 album. A Night At The Opera, named after the Marx Bros film, is widely acclaimed as one of the greatest albums of all time. 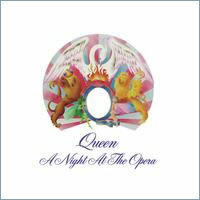 Exceptional on every level, musically, lyrically and artistically, Queen took the strongest elements of their previous two albums to make the ultimate winning combination. The most expensive album ever recorded at that time, it delivered Rock, Opera, Heavy Metal, romance, ballads, Pop, sci-fi Folk, music hall, Trad Jazz and even the National Anthem. The album contains perhaps the most famous Rock song of all time, 'Bohemian Rhapsody', which went on to spend 14 weeks at #1. Queen also recorded the first official Pop promo for 'Bohemian Rhapsody' as they were on tour and could not appear on Top of The Pops and this video paved the way for MTV and VH1.